When people think tequila, many think of margaritas or a burning shot sandwiched between a lick of salt and a wedge of lime. Tequila Ocho is out to break tequila’s frat boy reputation and remind you that tequila can be as refined as a top scotch, bourbon, or cognac. Towards that end, it succeeds in impressive fashion. Tequila Ocho is the first single estate vintage tequila to be introduced in the U.S. That means all the agave plants used—100% blue agave—are grown on a single plot of land and, like vintage bourbon, from a single harvest (in this case 2008). Unlike grapes where the same plot of land will bear ripe fruit every year, agave takes ten years before it is mature enough for harvest. This means that the plots of land used for the 2009 release will not be ready to produce agave ready to be distilled again until 2018, adding to the rare nature of each vintage. Tequila Ocho comes in three variations, Plata and Reposado, which can be found in select cities in the U.S., and an Anejo which, due to the extra aging that is required, won’t be available until the summer. Whether it’s that high sugar content or something else, the Reposado has a wonderful nose. Not at all harsh on your nostrils, it is best described as delicate with a lemon custard aroma and a hint of pine. But it really shined when the Ocho Reposado, which I tasted neat, finally touched my tastebuds. It greeted me with a smooth burst of citrus, mint, and oak. The finish was long and gentle. In case you’re wondering, sucking on a wedge of lime after sipping this smooth, subtle tequila would be wholly inappropriate. 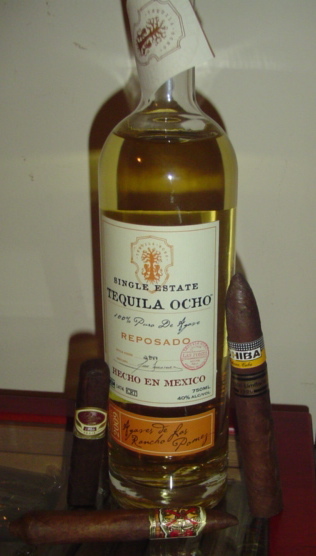 At $70 per bottle, the Tequila Ocho Reposado 2009 is not cheap. But the money would be well spent on a superb tequila that will expand your notion of what tequila can be. I will have to try Tequila 8, although at a recent tasting, I tried Metl Mezcal and thought the smokiness of the drink really paired up nicely with a good stogie. Definitely worth trying again. Tequila 8 is a great tequila, others which are worth trying are Casa Noble, Tesoro and Chinaco. I honestly never would have thought to pair a cigar with tequila. Margarita? Yes. Straight up? No.